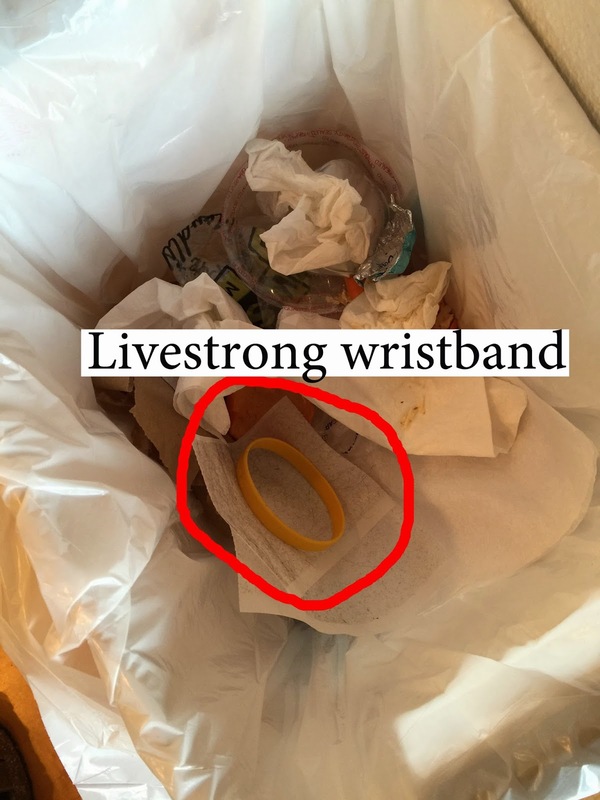 I found the yellow band and threw it in the trash. I always figured Lance Armstrong for a performance-enhancing drug taker. But I defended him for it, rationalizing all the other major riders of his era were on the juice, so he was the best drug taker in a field of drug fiends. I recently watched Stop At Nothing: The Lance Armstrong Story and was saddened by the mountain of evidence that Lance had not only repeatedly lied, but slandered and maliciously destroyed those who would speak against him. Far from a kid who had grown up in bad circumstances and succumbed to the pressure of international athletic competition, Armstrong was shown as a ruthless sociopath who would stop at nothing to increase his fame and fortune. I personally felt betrayed as I wanted so much to believe the story -- through mental toughness and determination Armstrong came back from cancer and won an unprecedented number of bike races. All of it a lie. Further disheartening is that there is circumstantial evidence that Armstrong gave himself cancer by ingesting a horrific amount of steroids, testosterone, cortisone, growth hormone, and EPO early in his career. The film hints that Armstrong's political connections got him out of an FBI investigation, suggesting that people at all levels wanted the story to be true, wanted Lance to be the real Superman who saves America from the French and other unredeemed Europeans. The film proves the theory of American exceptionalism, but not in the way we would like. The truth is painful, but ultimately we need to find our heroes closer to home and a bit more humble.